Adolf Hitler holding a speech in German (6ACV07). The German language (Deutsch) is a language spoken in Germany, Austria and other central European countries. A recurring joke in Futurama is that the French language is dead by the 31st century. In the French dub of the series, however, German is the dead language instead. These are appearance with the German language, and not reference to German culture in general. 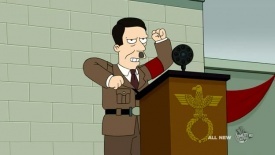 - The time machine stops in the 1940s and we see a German speech by Adolf Hitler. This page was last edited on 27 July 2013, at 00:41.